A GREAT-ER kind of movie…. The story of Brandon Burlsworth, possibly the greatest walk-on in the history of college football. 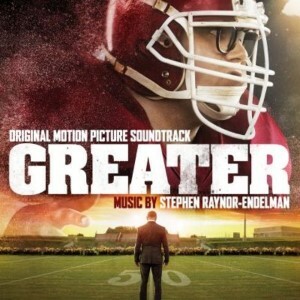 You do not have to be a football fan to enjoy this movie because although Brandon’s goals were to become an Arkansas Razorback and eventually for an NFL team, the movie is about much more than that. It’s about faith, family, ambition, determination, drive, and beliving in yourself when no one else does. And if after watching it, you aren’t touched, then you better check your pulse because you may not be alive. Brandon Burlsworth worked hard for everything he had and everything he wanted. But one of the best things was that unlike a lot of people, he was not only focused on himself but also on his friends and family. He made those around him believe not only in him but in themselves as well. He was living his dream-playing for the Razorback team, graduating with a master’s degree, and signing with a NFL team when out of no where, tragedy struck. Sadly, Brandon was killed in a car accident one day in April 1999 while on his way to pick up his mom for church services. His death rocked not only his family, friends, fellow players, and coaches but also the the entire football industry and fans. It was a tragic loss of great man. A kind and and gentle giant with the biggest heart and soul anyone had ever known. Brandon’s jersey #77 is retired at the University of Arkansas. It is only the second retired football jersey in school history. His locker is enclosed in a glass case in the Razorback locker room. The Harrison Youth Center in Harrison, Arkansas, was renamed the Brandon Burlsworth Youth Center in May 1999. The Indianapolis Colts wore his initials, BB, on their helmets for the 1999 season. In honor of his work ethic and Christian values, the Christian organization’s mission is to support the physical and spiritual needs of children, in particular those children who have limited opportunities. The foundation’s logo prominently features Brandon’s signature boack-framed glasses. For this program, the Burlsworth Foundation provides underprivileged youth a chance to attend Razorback and Colts football games. Since 2000, the Foundation has bought 30 tickets to each Arkansas Razorbacks home football game. The tickets are distributed through Razorback Clubs across the state. The children are a big part to the foundation. The children are given an official “Burls Kid” T-shirt and replica glasses similar to what Brandon wore on the field. The Brandon Burlsworth Foundation, in partnership with Walmart/Sam’s Optical Department and independent optometrists across Arkansas, provides eye care to thousands of pre-kindergarten through twelfth grade students. Primarily they come from working families that cannot afford extras like eye care and do not qualify for state funded programs. Applications must be submitted by school nurses or counselors and are available in English, French, and Spanish. Each year the Brandon Burlsworth Foundation gives out several awards and scholarships at various school levels. Eighteen students at the University of Arkansas who are primarily from smaller towns and who are characterized as academic “overachievers” receive $5,000 scholarships. Additionally, a Razorback football player who began his career as a walk-on, but then earned a football scholarship, is honored as the year’s Burlsworth Athletic Scholar. The students are selected by the University of Arkansas Scholarship Committee and are recognized in a ceremony in Fayetteville, Arkansas. High School awards include the Brandon Burlsworth High School Football Awards. Every high school football coach in Arkansas has the opportunity to nominate one player from the team. Those players receive a plaque and a copy of “Through the Eyes of A Champion, the Brandon Burlsworth Story” autographed by Brandon’s mother, Barbara Burlsworth. An even greater honor, the Brandon Burlsworth Championship Award is presented at the Arkansas state football championships games to one player from each team for conduct above and beyond expectations. Harrison (Arkansas) High School continues to award the Brandon Burlsworth Award to one male and female athlete who best exemplify the strength of character and work ethic known as “The Burls Way”. The Brandon Burlsworth Award is given out yearly to a male and female at Harrison High School and the University of Arkansas. 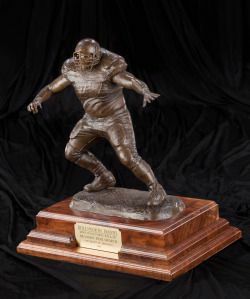 In 2010, the Burlsworth Trophy was created and named in his honor. The award is given yearly to the most outstanding Division I FBS college football player who began his career as a walk-on. TO SOME, BRANDON BURLSWORTH WAS A HERO. TO MANY, HE WAS AN INSPIRATION. TO ALL, HE IS GREATER. Amy Deason interviewed by Jen Selinsky-hey, that’s me!! Hi all. I was interviewed by Jen Selinsky and I wanted to share it with you here. Click the link below to check out the rest of the interview. Enjoy! How old were you when you knew you wanted to be a writer?